(ZIZ News) — Minister of Public Infrastructure, The Hon. Ian Liburd says “The Recently Launched Park Hyatt Hospitality Programme will have a “cascading effect on the economy”. 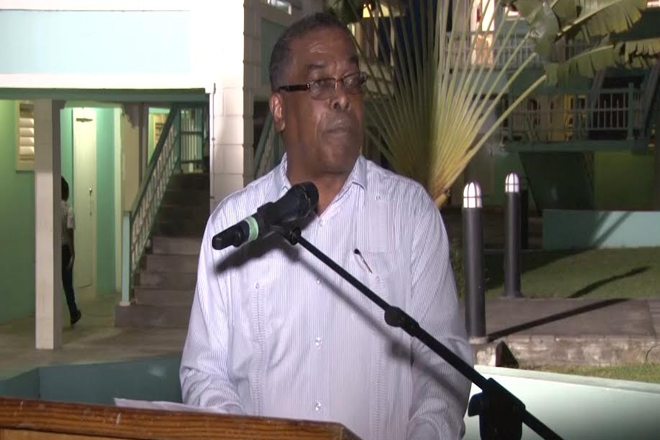 Minister Liburd made the comments while presenting the keynote address during the opening ceremony of the Hospitality Introductory Training Programme at the Clarence Fitzroy Bryant College on Tuesday. “A project like the Park Hyatt project is very important to us as a government because this project has what I call a cascading effect throughout the economy. It actually touches the grassroot economy in St. Kitts and Nevis because the restaurants will benefit the taxi drivers will benefit, the fisher folk will benefit as well as our farmers”, Minister Liburd stated. Minister Liburd also praised the partnership between Park Hyatt, Range Development and the Government of St. Kitts And Nevis. He also said he looked forward to the opening of the Park Hyatt St. Kitts Hotel next year. “Partnerships like this one are the sought of partnerships that our government encourages. So we wish to continue supporting the further development of our product and as a government we look forward to spring next year as someone whether the Deputy, the Minister of Tourism, the Prime Minister or perhaps all of us will cut that ribbon to enter the new Park Hyatt hotel”, the Minister added. The Education and Information Sessions, taking place at the CFBC, will give persons who are not familiar with the hotel industry a better understanding what to expect. Apart from sessions for the CFBC Hospitality students, the management of the soon to be opened Park Hyatt St. Kitts will also be holding Hospitality Introductory Training sessions for persons involved in the Hospitality section of the People Employment Programme (PEP).